We all know Joseph is the father of Jesus, that he is was Mary’s husband, that he is was a carpenter, that he was a saint. But does your knowledge or reflection end there? This book, being only 134 pages could be an easy weekend read, or it could be a month long spiritual journey. Either way, this contemplative book works well for someone who knows nothing about St. Joseph, or his biggest devotee. At the conclusion of each chapter, Fr. Gilsdorf asks a handful of study questions if you want deeper reflection, or even if you had a study group. These are questions that have you looking through issues in your life at home, in society, and diving into the catechism. I don’t want to give away too much from this book, but a few parts that had me hooked were the discussion of St. Joseph sanctified in the womb, St. Joseph’s Staircase, his role in heaven, and the list of St. Joseph prayers and devotions in the appendix. In the St. Joseph Litany, I learned 2 names for Joseph I instantly fell in love with: Guardian of virgins and Terror of demons. If these are not two things we need, then what are? This review was written as part of the Catholic book reviewer program from The Catholic Company. 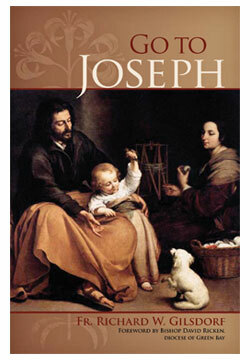 Visit The Catholic Company to find more information on Go To Joseph.